"There is nothing in this world that does not have a decisive moment"
Cartier-Bresson's work spanned photographic genres for the entirety of his long career. He is regarded as a pioneer of candid and street photography but he is also well-known for having produced some of the most compelling photographic portraits of notables ranging from Jean-Paul Sartre and Leonard Bernstein to Marilyn Monroe and Malcolm X. An early user of 35mm film, Cartier-Bresson preferred never to use the darkroom to adjust his photographs, a choice that enhanced the spontaneity of his images and emphasized what he called "the decisive moment." No single photographer is more closely linked to the development of modern photojournalism than is Cartier-Bresson, whose itinerant nature brought him to some of the most momentous events and sites in modern history - from the liberation of Paris from Nazi occupation to the assassination of Mahatma Ghandi. To enhance his capacity to take the kind of candid shots he preferred, Cartier-Bresson often wrapped his Leica camera in black tape to make it less obtrusive. Assuming the role of the modern flâneur, his camera became an extension of his eye as he wandered, seeking visually, psychologically, and intellectually stimulating visual material. Ironically, while Cartier-Bresson could linger for hours observing, patiently awaiting the perfect shot, he was always poised to make the snap decisions required to seize a given moment to fix in time. 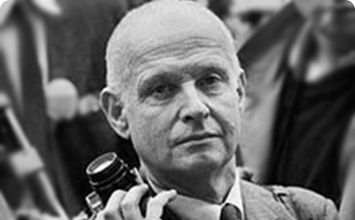 Cartier-Bresson co-founded The Magnum Photo agency - a cooperative owned by its members -that connected the photographers with clients around the world. The agency's mission was to widely disseminate photographs that were in one way or another exemplary of the modern era and also inherently humanitarian. In addition to still photography, Cartier-Bresson was an accomplished filmmaker, who first became interested in the medium when he worked with Jean Renoir. His filmography includes nearly ten films and he is regarded as an influential figure in the development of cinéma verité. Cartier-Bresson's earlier inclination toward painting endured even after he stopped painting to pursue a long and fruitful career in photography. While he didn't return to producing canvases actively until late in life, the formal training informed his photography, disciplined his eye, and compelled him not only to continue to cultivate relationships with the notable, avant-garde painters of his era but also to regard his own photographic style as a kind of nexus between painting and photography. 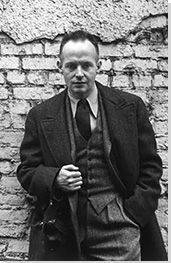 Born in Chanteloup-en-Brie, France in 1908 to a wealthy textile merchant, Henri Cartier-Bresson was the eldest of five children. His mother, Marthe, exposed him to the arts including taking him on trips to the Louvre in Paris, attending chamber music concerts, and regularly reading him poetry. His father, Andre, was a severe man, consumed with the role of paternal duty and dedicated to his successful textile business. In response to his father's defection to the world of business, Henri vowed at an early age never to follow in his father's footsteps. Interactive chart with Henri Cartier-Bresson's main influences, and the people and ideas that the artist influenced in turn.